This was such a beautiful day. 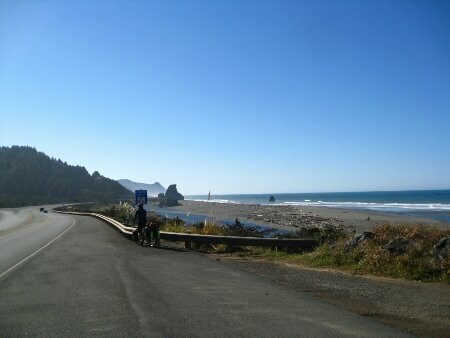 Dallas and I enjoyed sunshine and comfortable temperatures all day, with gorgeous views of Oregon’s coastline along much of the ride. The first half, from Gold Beach to Brookings, was awfully hilly and included some of the longest climbs of our tour so far. The descents were rewarding but were over too quickly. I felt like much of the first 30 miles was spent climbing hills at a pace of around 5 miles per hour. Brookings is the southernmost town in Oregon, and Dallas and I spent a little too much time there. Since all the hills slowed us down, we got there a bit later than anticipated and didn’t actually get our daily dose of espresso until after 2pm. This coffee shop we found was nestled by a harbour, with several docks and a cluster of little food places right off the road. In between coffee and pizza, we spoke with Jeremy, who was staying with his girlfriend on their sailboat. Like us, he had quit his job for a more adventurous and fulfilling life of seasonal jobs with plenty of vacationing in between seasons. Hopefully we will run into him and his girlfriend again down the road. We ordered a pizza with salad on it from the nearby pizza place, and then moved on to the place next door for ice-cream cones before hitting the road again. It was after 4pm when we finally left Brookings, and it was another 30 miles to Crescent City. 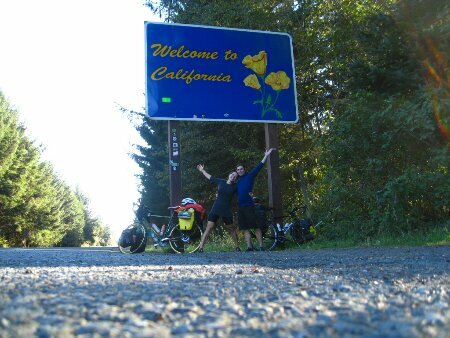 We finally made it to California! 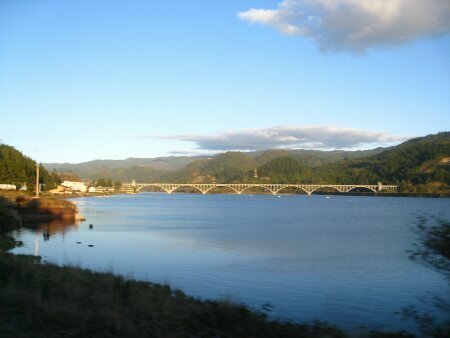 So far, I think Oregon is more beautiful, but our route took us inland a bit once we crossed the state border. More coastline and redwood forests await us tomorrow, so I’m sure California will redeem itself. 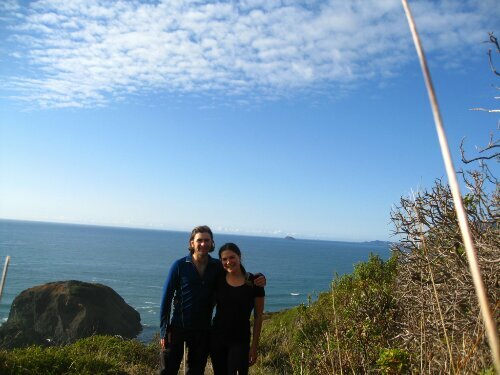 Dallas and I had hoped to make it a few miles past Crescent City and into Del Norte Coast Redwoods State Park to set up camp, but the sun was setting as we stopped at the grocery store, and Dallas had remembered climbing a steep hill with no shoulder to get out of Crescent City. We didn’t want to deal with that in the dark, so we’re staying in town tonight and will try to get an early start in the morning to make up for it. Today marks the end of a week since when we left, and in total, we’ve gone 350 miles. Both of us woke up bright and early, with high expectations for the day, which we failed to meet. Dallas started tuning his bike derailleurs and tightening spokes, and a man in the campground named Mike struck up conversation with us, delaying our packing. 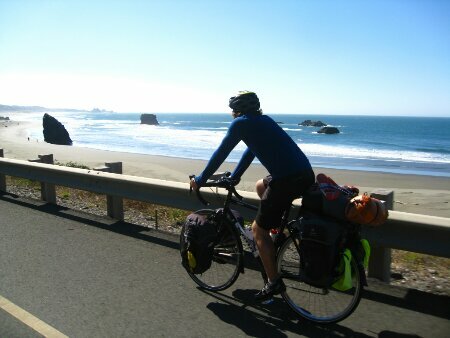 This guy had ridden up and down the coast 13 times before, and also around Australia, New Zealand, and Hawaii. He stuck around for a while, and went on about bicycles, his dogs (at one point he had 12 of them living in his RV with him), and the felony he got after 13 years of selling marijuana in Michigan. We were hoping to get to Port Orford and into a cafe before the predicted rain began, but it started misting just before we were ready to leave. When we did venture out from the safety of the tree cover, it started to rain steadily. 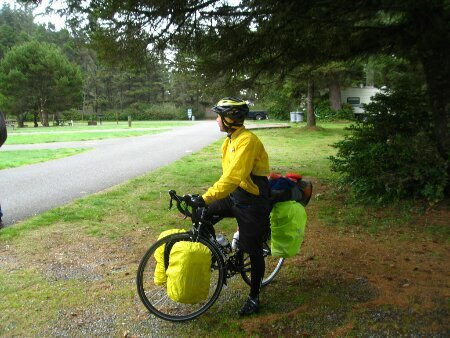 The first 14 miles to Port Orford were pretty miserable, but it actually stopped raining just before we got there. Paradise Cafe is a small diner on Route 101 that boasts free WiFi. We sat down in a booth next to a couple, and the man immediately started talking to us. He told us that they were also camping around there, and they were impressed with our riding. He also told us about their pug (named Pugsly) that only has three teeth and needs to eat special food. Then he must have thought we were bowing our heads in prayer when we were actually trying to steal glances at our menus, because he told us how nice it is to see young people pray before a meal. We politely engaged the couple in conversation, but then moved to a different table after ordering so we could sit by the one outlet we could find and charge our phones. Before leaving, the woman gave us $20 for our breakfast! We are always so blown away by the generosity and kindness of strangers, and this was no exception. It definitely pays to be nice to strangers. We had perfect weather for the rest of the day, but we were way behind our hopeful schedule, and our legs were just too tired to maintain a fast enough pace. 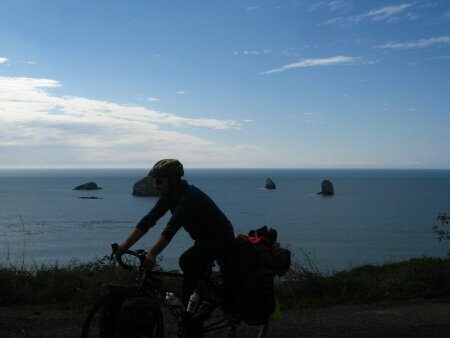 Much of the ride after Port Orford was within view of the ocean, and it really was beautiful riding. 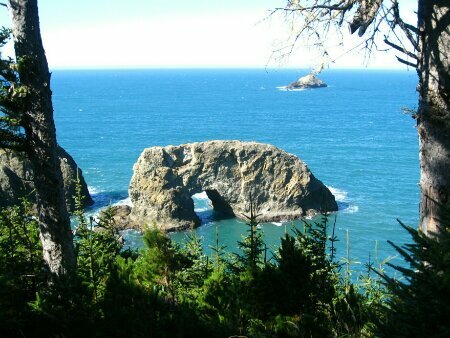 We were still 28 miles away from Brookings (our goal) when we stopped in Gold Beach. We found a really cheap motel, although we ended up spending more on dinner at the Port Hole Cafe (we were really hungry! ).